The film is the story of the amazing O Winston Link’s documentation through film and sound of the last days of steam railroading in America. The film follows Mr. Link, while in his late 70's, on a reflective trip to the scene of some of his most iconic images. Mr. Link, in his own words tells his belief that his works captured more than the end of the steam era, but also the passing of a way of life in rural America. "Trains That Passed In The Night is a superb documentary that accurately and entertainingly preserves a genuine piece of Americana. 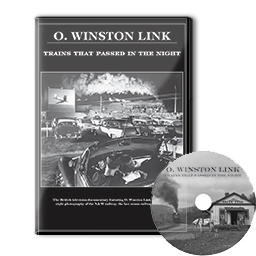 O Winston Link focusing on the people and the countryside rather than runbys of trains, it nevertheless captures in sounds and imagery Link’s steam era and brings it alive today. It is one of the finest programs ever assembled on a rail-related subject."